Nia Vardalos is one of the writers of the new film “Larry Crowne” currently filming in Los Angeles. Rita Wilson and Tom Hanks watched Nia as the star of the play ” My Big Fat Greek Wedding.” The two decided to turn it into a movie and it became one of the highest grossing independent films of all time making over 250 million dollars. 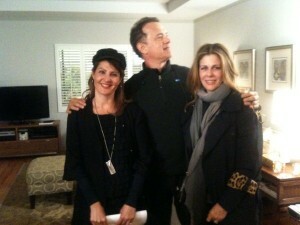 Nia Vardalos, Tom Hanks and Rita Wilson became friends and Nia has been writing films with the Tom and Rita ever since. Tom Hanks is “Larry Crowne” starring with Julia Roberts in this comedy about a middle-aged man who loses his job and reinvents himself by going back to college.